A drone squad, designed to locate and - if necessary - capture nuisance drones flown by members of the public, is to be launched by police in Tokyo. The police unit will patrol important buildings such as the prime minister's office. If a suspicious drone is detected, the operator will be warned via loudspeakers on the ground. But if he or she fails to respond, police will launch drones equipped with nets to bring down the device. "Terrorist attacks using drones carrying explosives are a possibility," a senior member of the police department's security bureau told the Asahi Shimbun website. "We hope to defend the nation's functions with the worst-case scenario in mind." 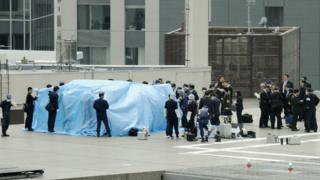 In April, a drone carrying a small amount of radioactive material landed on the roof of the prime minister's office. No-one was injured and a man was subsequently arrested in connection with the incident. A video posted online by Japanese website Jijicom shows how Tokyo Police's drones, complete with nets, might catch an unwanted airborne device in action. "In Japan, it is illegal to pilot drones over certain areas such as airports and power plants, over roads, or above a height of 150m," Paul Haswell, a partner at legal firm Pinsent Masons, told the BBC. "Some cities such as Tokyo and Osaka have also outlawed their use in parks." Regulations on drones came into force in Japan this week, following an amendment to the country's Aviation Act. "Japan's new net-carrying, drone-disabling drone is certainly an interesting way to police those areas where drones are forbidden," added Mr Haswell. Can technology keep our skies safe from nuisance drones?